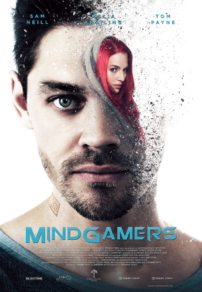 The official US release of grounded sci-fi and mind-bender ‘MindGamers’ is just round the corner. March 28th, 2017 is the movie’s release date in cinemas across the US. ‘MindGamers’, directed by Andrew Goth, staring Sam Neill (Jurassic Park) and Tom Payne (The Walking Dead), follows a group of brilliant young students who create a wireless neural network with the potential to link every mind on Earth via a quantum computer – but they soon discover that their innovation is part of a far more sinister experiment. The highlight of the official US release is, that for the first time, one thousand human minds will be simultaneously connected live. 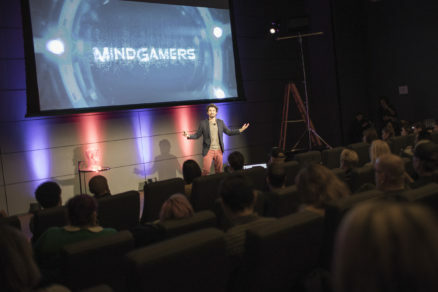 In this MindGamers Experience one thousand audience members in movie theatres in Los Angeles and New York will watch the innovative feature film ‘MindGamers’ whilst wearing a small ‘cognition-reader’ on their forehead. After the screening the results will be presented live. The scientists headlining the event are eager to analyse this example of mass cognition to get a glimpse as to how differently people react to the same portrayed emotions and situations. Leaders in the field of consciousness hacking, such as Mikey Siegel of Stanford University, believe that the data gathered from this experience could significantly inform future research, as science takes us closer to not only a brain-computer interfacing but also towards a brain-to-brain connection between people. “As a studio, we have taken on the challenge to create cinema that pushes new boundaries and goes beyond the ordinary,” Walter Köhler, CEO of Terra Mater Factual Studios, comments on the ideas behind ‘MindGamers’. So what if you could suddenly share the mind and skills of a Stephen Hawking, Beyoncé, Usain Bolt or anyone and everyone on the planet? Based on real contemporary science, we re-imagine the modern movie-going experience with the first action film for the mind. Be sure to watch the trailer for ‘MindGamers’; for stunning visual artwork, check out Instagram. And to experience a brand-new interpretation of the Marvin Gaye-classic ‘I heard it through the Grapevine’, for which The Wanton Bishops and Red Bull Music Publishing composer Ben Fowler have most successfully teamed up, this way please for the official music video for ‘MindGamers’, while the movie’s OST, composed by Ben Fowler as well, can be found on various platforms. March 28th, 2017 can be marked in calendars as the date for a once-in-a-lifetime occasion. The event will present leaders in the fields of technology, neuro-science and consciousness-hacking, a live Q&A and will reveal the world’s first image of collective human cognition – created simultaneously by the audience.